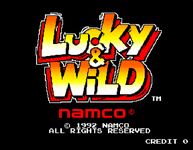 Lucky & Wild is a 1992 rail shooter arcade game developed and published by Namco. The game's plot and setting resembles the 1989 American action/comedy film titled Tango & Cash. Source: Wikipedia, "Lucky & Wild", available under the CC-BY-SA License.